Shell Trading (US) Company (Shell) today signed a long-term charter agreement with Q-LNG Transport, LLC (Q-LNG) for a 4,000 cubic metre (cbm) liquefied natural gas (LNG) bunker barge - the first of its kind in to be based in the U.S., says Shell. The bunker barge, which will be owned and built by Q-LNG and operated by Harvey Gulf International Marine, LLC (Harvey Gulf), is intended to supply LNG bunkers along the southern U.S. East Coast and support growing cruise line demand for LNG marine fuel. "This investment in LNG as a marine fuel for the U.S. will provide the shipping industry with a fuel that helps meet tougher emissions regulations from 2020," said Maarten Wetselaar, Integrated Gas and New Energies Director at Shell. The bunker barge... is intended to supply LNG bunkers along the southern U.S. East Coast of the U.S.
"Our commitment in the Americas builds on Shell's existing LNG bunkering activities in Singapore and Europe, as well as recently announced plans in the Middle East and gives us the ability to deliver LNG as a marine fuel to customers around the world." 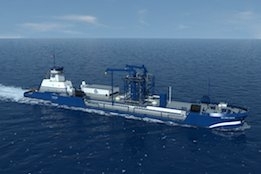 Last year, Ship & Bunker reported that Harvey Gulf's construction drawings for the 4,000 cbm LNG supply vessel had received approvals from ABS and the U.S. Coast Guard (USCG). Power could be for use in emergency situations.